News - Outkast in talks for 2014 reunion? Outkast in talks for 2014 reunion? Outkast are rumoured to be in "prolonged talks" to reunite for several shows in 2014. The Grammy-winning rap duo - Andre 'Andre 3000' Benjamin and Antwan 'Big Boi' Patton - are said to be in on-going discussions to end their six-year hiatus, on the 20th anniversary of their musical debut. According to Billboard, the Atlanta hip-hop duo are in talks to reunite for the 2014 Coachella Valley Music and Arts Festival in April, before playing a series of gigs. One source said that there have definitely been "some conversations" about Outkast reuniting, while another said it is "all systems go". Outkast, who released their debut Southernplayalisticadillacmuzik in 1994, shot to fame after enjoying chart success in the early 2000s with hits such as Ms Jackson and Hey Ya! but they decided to take a break to focus on their solo careers in 2007, following the release of their seventh album Idlewild. Big Boi has released two albums, and is producing part of Modest Mouse's next album, while Andre 3000 will star as Jimi Hendrix in John Ridley's biopic All Is By My Side. There was speculation in January that the duo had reunited after they appeared on two new tracks - a remix of Frank Ocean's Pink Matter and a remix of rapper TI's Sorry, but Andre said he recorded his cameo as a solo artist. "I was approached as a solo artist by both Frank Ocean & Tip (TI). It was after that when Big Boi's name came up. 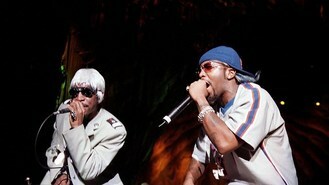 These songs are not Outkast collaborations," he told Spin. Boyzone have said they are too old to compete with bands like One Direction. Despite releasing her first single more than 30 years ago, Madonna has been named the highest-paid musician of 2013. Kings Of Leon have criticised raunchy pop performances saying they feel like "the end of the world". The Rolling Stones are heading Down Under - and they're taking Mick Taylor along. Mexico's president has denied a tweet by Justin Bieber saying the singer met with the president and his family prior to a show. Arctic Monkeys are to headline next year's T in the Park festival, organisers have announced. One Direction's new single Diana has topped the iTunes charts worldwide, within a day of its release.